Part of what makes Orlando such a great fishing spot is the sheer quantity and quality of options. 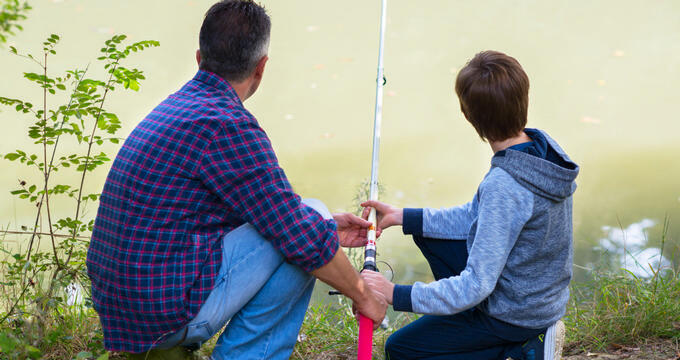 There are so many different lakes and rivers of all shapes and sizes in and around the Orlando area, keen anglers of all ages and experience levels will find dozens of super fishing spots with ease. Saltwater fishing in Orlando can be simply fantastic, with the likes of red drum, black drum, sunfish, largemouth bass, bluegill, and many other species of fish swimming all around the various lakes and state parks in the city and its surroundings. Largemouth bass - Many people wouldn't assume Orlando to be a great bass fishing location, but experienced anglers know that this area can actually produce some incredible catches. The area provides several super bass fishing lakes, all within a short distance of central Orlando and the big theme parks. The Conway Chain of lakes is a great spot for bass fishing and the Butler Chain is even better. Bass spawn in this area from December through to March, so the spring months can be a super time to nab some big bass as they all tend to be hungrier than ever. Sunshine bass - As the name suggests, sunshine bass are a product of the Sunshine State. These freshwater fish were made in Florida by crossing white bass and striped bass. They appear in lakes all around the state, including around Orlando, and are very heavy feeders, so can be quite easy to catch, especially at their most active times of day before sunrise and in the early evening. The state record for this species is a little over 16 pounds. Catfish - Catfish can be caught all-year long around Florida, including in the Orlando area, especially just south of the city in the Upper Kissimmee Chain of Lakes. Bullhead, channel, and white catfish can all be caught around here, especially during the warmest months of the year from May through to August. The best spots for catfish fishing are around creek mouths and by drop-offs. Orlando is famous for its Disney World theme parks, so why not take advantage of those theme park waters to do some fishing? Believe it or not, the lakes of the Walt Disney World Resort, including Seven Seas Lagoon and Bay Lake, can actually be a very good spot for bass fishing in Orlando. One of the prettiest natural wonders in the Orlando area is Lake Tohopekaliga, often shortened simply to Lake Toho. With a full marina and several fishing guides along the shoreline, it's easy to see that Lake Toho is a top fishing spot, with some really big bass being found in these waters each and every year. Part of the Butler Chain of Lakes, Lake Louisa is another top spot for Orlando fishing. Fitted with fishing piers and several great shoreline fishing spots, this is a super location to sit back, relax, and wait for the bass to start biting. It's only a short drive outside of Orlando and provides some great catches all-year long. If you're looking for a great fishing spot near downtown Orlando, this is the one. Clear Lake is a great spot for hybrid bass and channel catfish. Thousands of them are stocked into the area each and every year and can be caught with ease during the warmer months of the year.